I was clicking through the satellite movie guide last night trying to find a decent movie to watch …. not much on worth watching. CLICK – vampire movie, enough ! What the hell is going on with all these vampire movies? Scheduled from 6:00pm through 8:00pm, there were eight different vampire movies. Why the sudden interest in vampires, and why is it so interesting to watch some weirdo with bad dental work bite people on the neck? Turns out, making movies about vampires is not a recent phenomenon. I Googled ‘list of vampire movies in English’ and found a website that listed 2,250 vampire movies, dating back to the silent film days. OVER TWO THOUSAND VAMPIRE MOVIES !!! Jeez. Buffy the Vampire Slayer: This 1992 movie about a high school cheerleader ‘chosen’ to slay vampires eventually morphed into a successful TV series. Ankle Biters: Released in 2002, this flick apparently features very short vampires. Toothless Vampires: Produced in Hong Kong, this 1987 release covers the obligatory theme of handicapped vampires (now don’t we all feel better about ourselves?). Vampire Lesbian Kickboxers: As was the case with handicapped vampires, there HAD to be a film that featured the alternate lifestyle set. This one hit the theaters in 2002. Blackula: This 1972 movie featured a black vampire (a rarity these days) and began a frenzy of other ‘peoples’ discovering that vampires were also in their midst (Eskimos, Aborigines, midgets, and New Yorkers were among the first). Bloodsucking Redneck Vampires: A 2004 release featured fast cars, moonshine (vampires hate sunshine) and buxom ‘Daisey Mae’ types with crotch-hugging cutoffs. Pardon Me, But Your Teeth Are In My Neck: You can’t make this stuff up. As you may have noticed, I have put a massive amount of effort into researching this article. And, during that time, I believe I have uncovered a few overlooked facts regarding vampires in general and Count Dracula in particular. 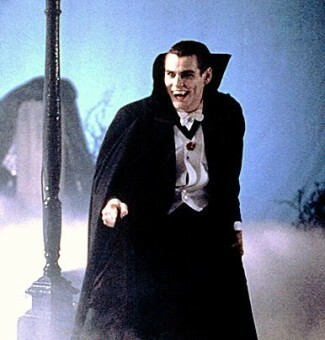 To wit: All movies about Count Dracula features a well dressed gentleman in a garish suit and cape with black hair – apparently soaked in 10W-30 motor oil - and slicked back over his head. Yes, ladies and gentlemen, Count Dracula was a Puerto Rican.